We believe music is fun and healing! FREE for all participants, our monthly workshops focus on vocal training and tips to address symptoms of PD, Sound Healing, meditation and singing for joy! SFYHealth was inspired by a former professional in the music business who has been battling the symptoms of Parkinson’s Disease and has learned to us music as therapy and a source for fun and inspiration. Please visit SFYHealth.com for information and to sign up for a workshop. I have been so fortunate to be able to create and thrive doing what I love. I’ve appeared on over 30 million records as a singer and songwriter. I’ve performed on stage, television, in film and video games and sung jingles for every product out there. But my relationship to my music completely changed when I began studying Sound Healing. When I first discovered Sound Healing twenty years ago, it was relegated to the “New Ageists” and spiritual gurus. I have had the opportunity to work with some wonderful teachers ~ Kevin Michael, Don Campbell, Dr. Louise Montello, Fabien Maman and the Venerable Dyani Yawahoo, to name a few. The more I explored the healing power of sound and singing, the more I was convinced that the role we play as singers/musicians is much more important than how many records we sell or whether we are “first call” on a record date. It completely changed my approach to my own creative work and ignited in me a fierce passion for teaching and a desire to get everybody singing! Most musicians and singers know instinctively that something amazing happens when listen to music and it’s even more powerful when we make music ourselves. The science is finally catching up and what they are discovering is really exciting! It is my firm belief that everyone can and should sing and that those who have exceptional talent and passion have been given that gift so they can give it to the world as healers and messengers. I am often asked to speak at workshops and conferences on the power of the voice to heal, enhance creativity and deepen the connection to the spirit. Please contact me if you would like to be put on my mailing list. 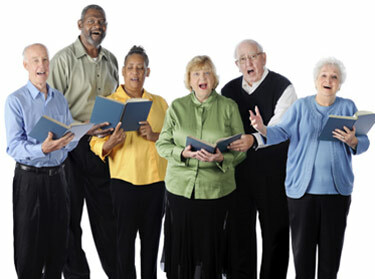 Please visit www.sfyhealth.com for information about SING FOR YOUR HEALTH! 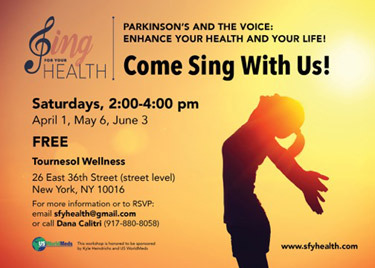 Parkinson’s Disease and The Voice ~ A workshop for those living with PD.